Just a quick update on our friends here in Clendenin, West Virginia! Many here are counting our blessings for no major flooding for the month of September. As hurricane Florence came up the east coast, we were under major flood watch. This back and forth of trying to anticipate any damage is such a reminder of the week of June 23rd, 2016. 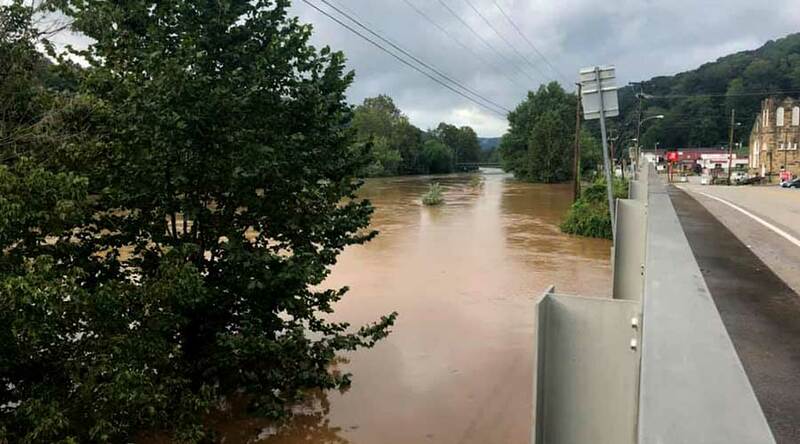 Thankfully, the photo shown is about as high as the river got in Clendenin, and as you can see it was a close call. For those of you who have experienced flooding of your own, or have been a volunteer in Clendenin, keep these neighbors in your prayers. Anytime there is a storm, our friends here experience a lot of fear and anxiety because of the flood of 2016. While it’s been over 2 years, the memories seem to come back each time it rains hard. The YMCA hosted an outdoor event this fall, which was unfortunately rained on, so they moved to the new pavilion finished by volunteers this summer! By creating a covered community space, Next Step was a piece of people coming together for a common goal, to further activities and support one another here in Clendenin. What a blessing to get a glimpse of that long term impact. Also on the Clendenin field, the Clendenin Little League has their Fall-Ball, Boys 7-8 year old, team playing baseball this fall! The last weekend in September the little league also hosted a community yard sale, and there was a main street fall festival with dozens of vendors and organizations present! Fall in West Virginia is here, and we are excited for the changing leaves, cooler weather, and lots of wonderful hiking. If you’ve never experienced fall in WV, come see us soon!